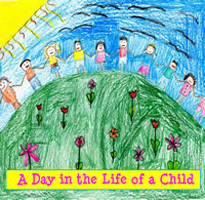 Below is a list and description of the songs in the A Day in the Life of a Child album. The songs in blue are included in A Day in the Life of a Child: Musical Revue. The show has four additional songs not included here - Music for Life, In My Room, Dance (an interactive song), and Mr. Moon.